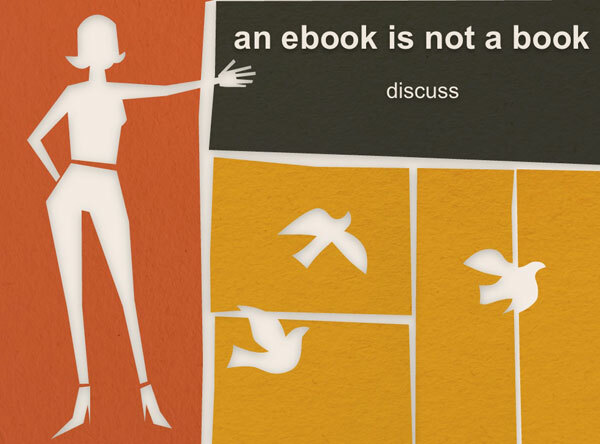 an ebook is not a book, discuss? I had a busy week. It wrapped up in the lovely state of Maine where I got to talk about the digital divide and ebooks to a bunch of Maine librarians. The digital divide talk is probably one you’ve seen various versions of, but the ebooks one is more or less new. My assertion is that the problem of ebooks is the problem of multiple perspectives [readers and authors and publishers and librarians don’t even agree on the landscape, much less the trees] as well as the problem of metaphors. At its core, one of the difficulties in teaching people about technology is that it’s teaching people to manage real invisible things [files, websites, social content] through a series of metaphors [“folders” “tagging” “friending”] that are more or less complex depending on people’s level of existing knowledge. While the printed word and language generally is something of a metaphor, you can read a book without really having to think about that level of abstraction. We’re not there yet with ebooks and the metaphors confuse the reality, a reality that is still shifting, hopefully moving towards if not some standards, at least some etiquette. In any case, both talks are here. I got a lot of good feedback on my general topic from Twitter and other social media interchange arenas. Thanks to those who helped me with this, and thanks to the nice librarians from Maine for coming to listen and talk. Tags: books ebooks jessamyn maine me!